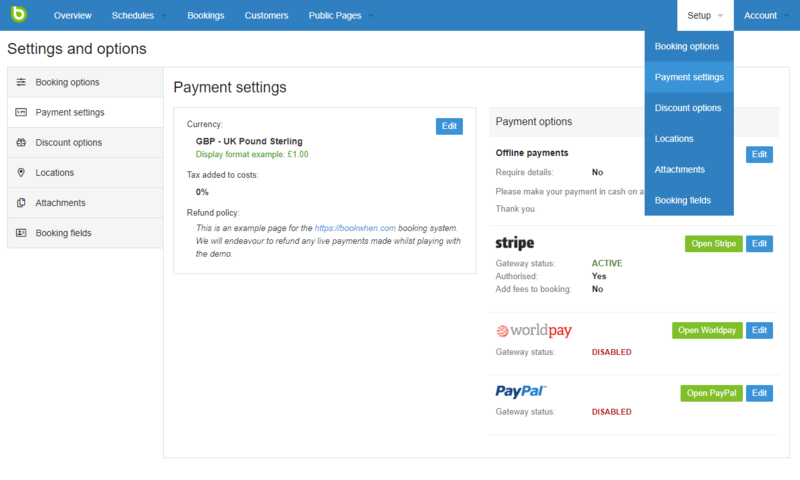 You may wish to read how payments work on Bookwhen before deciding your Payment settings. To receive online payments through Bookwhen you will need to ensure that you have set up a payment gateway. You can click on the 'setup' button next to your chosen service to initiate the process to link your gateway with Bookwhen (please ensure that you have signed up for an account with your chosen service before doing this). In the Currency section you can select the currency in which your Bookwhen page will operate (please ensure that this is compatible with your chosen payment gateway). You can read about our supported currencies here. You can also determine a Tax percentage which will add a percentage cost onto your future bookings to account for tax you need to pay. If your prices already account for tax you can leave this as zero. Bookwhen recommends that you enter a Refund policy within payment settings, this will appear in the footer of your public page. For some payment gateways a refund policy is required. Here you can decide if you wish to accept offline payments (payments taken in person, or by any method other than your payment gateway).